Our professional concrete driveway staining in Hermosa Beach CA can make your driveway a work of art. Your driveway plays a big role in the curb appeal of your home or business. A long expanse of plain white concrete can be boring or even an eyesore if it doesn’t complement the overall design of your property. Make sure your driveway is an asset, not a liability, by coloring it with concrete driveway staining in Hermosa Beach CA. Beautiful: With concrete driveway staining in Hermosa Beach CA, you can imbue plain, boring concrete with rich, deep, dimensional color. We use water-based stains to give you the largest possible color palette of pre-mixed stains. We can also layer stains on top of each other or create different colored borders to achieve the specific look you desire. Quick: Typically, any project that is big enough to dramatically affect your curb appeal means days or weeks of inconvenience as workers swarm your property. 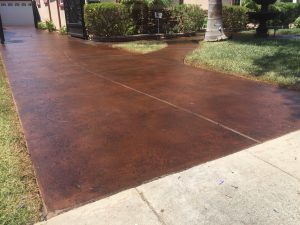 But concrete driveway staining in Hermosa Beach CA can be done in a matter of days, giving you almost instant improvement in your curb appeal. Cost-Effective: When you consider the high cost of a whole new concrete driveway, or the even higher cost of a driveway made from real stone or pavers, concrete driveway staining in Hermosa Beach CA becomes a very affordable alternative that allows you to create the look you want without the high cost. Concrete driveway staining in Hermosa Beach CA isn’t as easy as you might think. It takes skill and experience to get every step right, which is why you need to hire a professional. At Fuller Concrete Staining, we have many years of experience staining old and new driveways and we know how to get the job done right. You can trust us to help bring your design vision to life, and your satisfaction with the quality of our work is always guaranteed.